A template Install script is provided in the custom app template tarball. The Install script is responsible for installing any app dependencies. It must accept the following command line arguments: install, postinstall, and remove. 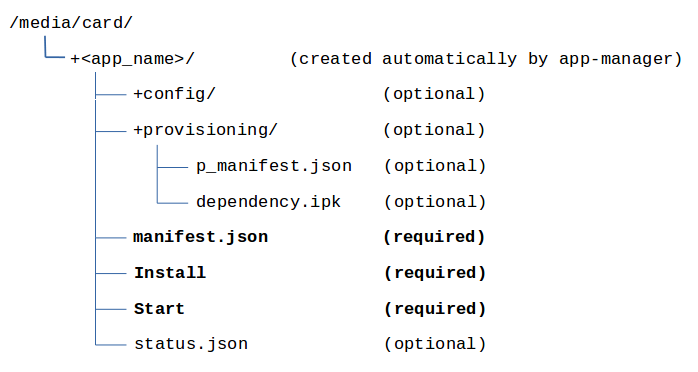 The provided template is configured to install IPK files listed in p_manifest.json, but this script can be fully customized to your needs including removing the IPK installing code. The below process flows show exactly when and how the Install script is executed. app-manager either downloads the app tarball from DeviceHQ or if manually installing, checks it’s existence at the given path. app-manager creates a directory in /media/card/ with the app name from manifest.json. If a config file was selected when queuing the Install command from DeviceHQ, app-manager downloads the config file and places it in the config/ directory, overwriting any existing files. app-manager starts the app via the Start script. app-manager stops the app via the Start script.